Kathy is a graduate of McGill University in Montreal, Canada. She has experience in the areas of outpatient physical therapy, acute care, and home health care. Kathy individualizes her treatment plan for each patient to include functional activities that will help the patient return to the activities that are important to them. 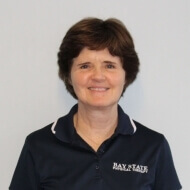 Kathy’s treatment approach includes manual techniques, functional exercises and education to ensure the patient has a proper understanding of the rationale for their treatment and exercise program. When not working Kathy enjoys traveling, biking, cross-country skiing and baking, especially gingerbread houses.